A few weeks ago we came out with custom fields for properties. A lot of users jumped on the feature immediately, but a few other users pointed out how useful it would be to be able to add custom fields at the booking level too. So we did that. If you go to custom fields and add (or edit) one, you'll notice a new Type field showing. 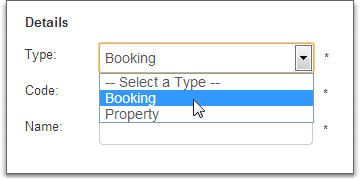 The Type field lets you pick whether the field is to be used on bookings or properties. Everything about how custom fields for bookings are implemented is exactly the same as it is for properties. Open a booking and you'll notice a new Custom Fields tab. If you click in, you'll see the exact same layout that you have with properties. The fields and options are exactly the same. In the email templates, the field selector shows your custom booking fields at the end of the system booking fields. Select the field and you're done. One thing to note - when previewing your email templates, custom booking fields do not show a value. The system cannot show a value when previewing because it does not know which booking value to use. What else would you like to see changed or added to custom fields? We've had users ask for a default value - that is, the custom field has a starting value that is used if a value isn't assigned at the property or booking level. Is that something your workflow could use? As always, feedback is welcomed! Possible to auto generate an email with lock codes, directions, etc. when the booking is paid in full? I'm trying to use the custom fields to place a link for the credit card URL for the booking in emails booked on external sites so I can send the guest an email to pay the cleaning fee and capture their card for the security deposit. I'm not seeing how to do that unless I copy the URL for each booking to the custom field??? Somehow I don't think this is how it's supposed to work... can you help?